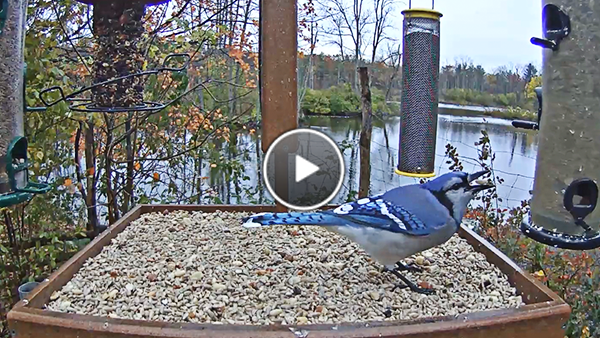 This Blue Jay tosses back one of many peanuts during a visit to the Cornell Lab FeederWatch Cam. As many of the birds on the Cornell Lab FeederWatch cam begin to cache away food for winter, thousands of bird lovers across the U.S. and Canada are preparing to count feeder birds for science by participating in the 31st season of Project FeederWatch! 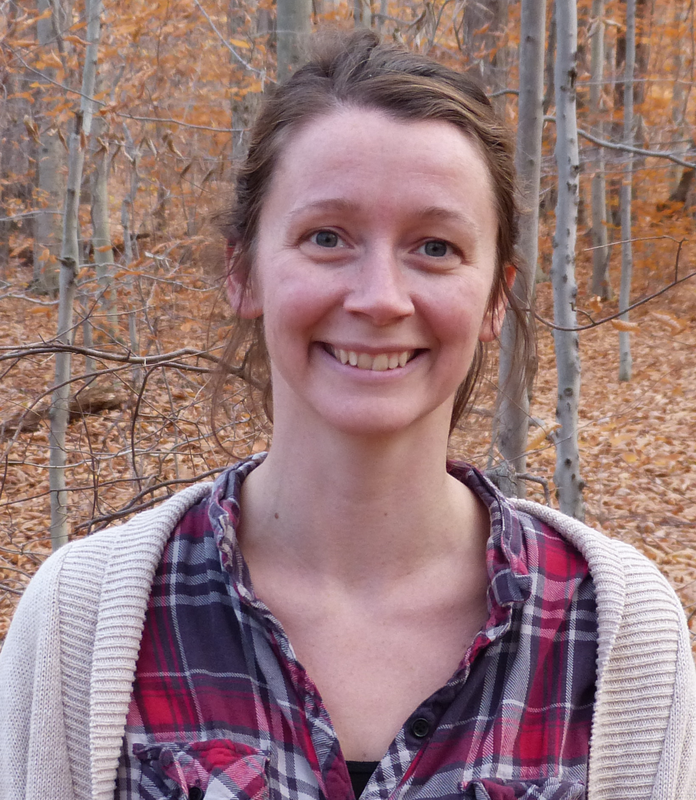 Join us for a live Q&A with the Cornell Lab Project FeederWatch’s Dr. Emma Greig and Chelsea Benson to learn about how watching the birds at your feeders can contribute to science! Tune in live on the Cornell Lab FeederWatch cam from 11 A.M.–12 P.M. Eastern Time on Wednesday, November 8. 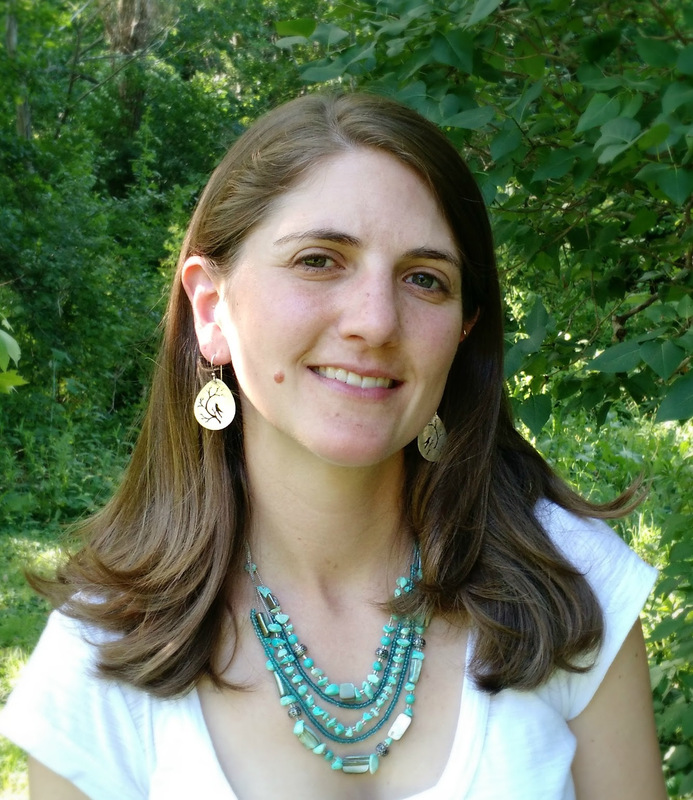 In addition to answering your burning questions about bird feeding, Emma and Chelsea will highlight how you can help Project FeederWatchtrack trends in bird populations and behaviors by submitting observations from the feeders in your own backyard! If you have a question for Emma and Chelsea, email it to birdcams@cornell.edu or tweet @FeederWatch Cam with the hashtag #AskFeederWatch. We’ll do our best to answer as many questions as possible! 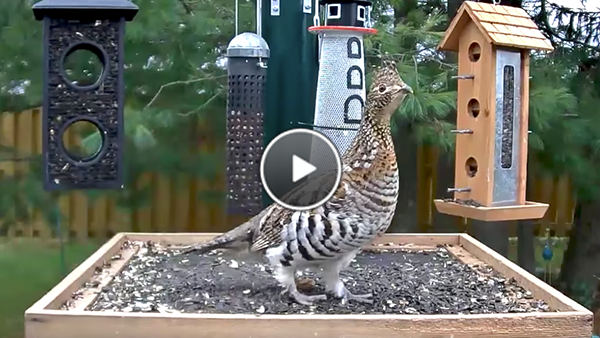 A Ruffed Grouse interrupts a group of Evening Grosbeaks foraging at the feeders on the Ontario FeederWatch cam in 2016. Have you missed the colorful Pine and Evening Grosbeaks, curious Gray Jays, timid Ruffed Grouse, and noisy Common Ravens that populate the feeders on the Ontario FeederWatch cam? We have good news. Your favorite boreal birds should be back online in less than a week! In the meantime, watch highlights from past seasons of the Ontario FeederWatch cam to brush up on your boreal species identification skills, and don’t forget to enlist the help of the bird species guide from All About Birds if you get stuck. See you soon, live from Manitouwadge, Ontario! 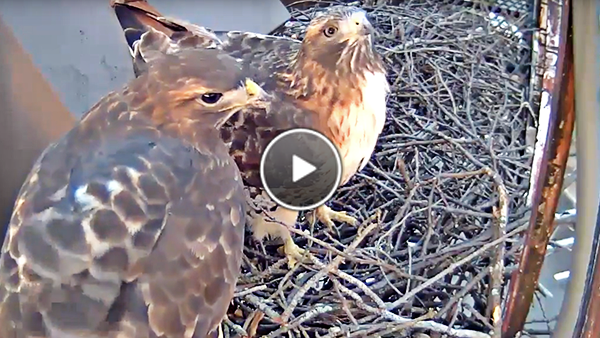 Big Red (left) and her new companion stop by the Red-tailed Hawk cam to conduct rearrangements at the nest site near Fernow Hall. Big Red and her new companion seem to be getting comfortable with the nest site near Fernow Hall on the Cornell University campus. In the past month, we’ve seen the pair visit the Red-tailed Hawk cam multiple times to make “nestorations.” The male has been especially busy delivering sticks, forming the nest bowl, and scoping out the areas surrounding the nest. In New York state, some Red-tailed Hawks migrate south for winter while others remain year-round residents in their territory. In past years, Big Red and Ezra overwintered in their territory together, and it looks like this new male will also brave the cold winter months in Ithaca, New York. The upcoming breeding season will answer many questions about this prospective mate, but for now it’s good to see the pair visiting the cam and tending to the nest site! Watch cam.